The outdoor antenna can pick up good mobile signal from outside of your house, and send the signal through coaxial cable to the booster. 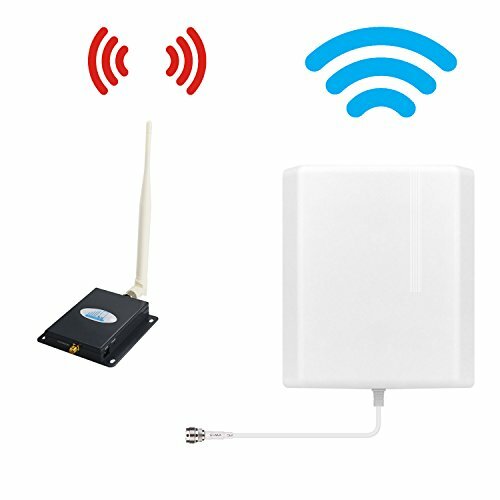 The cell phone signal booster can amplify the signal, then the amplified signal is sent to the indoor antenna. The indoor antenna can transmit the signal into your house, so you can enjoy clearer phone call or faster mobile date inside your house. Supports voice and 4G data for 4G/LTE Verizon mobile phones, including IOS , Android, Windows Phone Systems, etc. High Gain 65db - Strengthen the weak signal for home or office in rural areas, reduces disconnected calls and improves the voice quality. Easy to Install - The installation requires no technical experience with easy plug-and-play style setup, safe and convenient to use. With FCC authentication certificate and quality guaranteed.